Colonel Gregory A. Daddis is an Academy Professor of History at the United States Military Academy, West Point, New York. 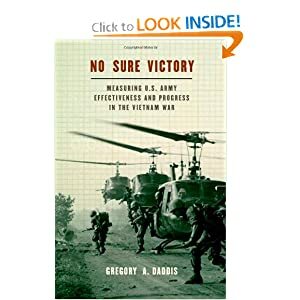 He is author of No Sure Victory: Measuring U.S. Army Effectiveness and Progress in the Vietnam War, published by Oxford University Press. Perhaps unsurprisingly, the U.S. Army faced comparable problems in measuring its progress and effectiveness during the nearly decade-long war in South Vietnam. Military and civilian leaders alike struggled with a similar lack of consensus over how well those prosecuting American strategy in Southeast Asia were achieving their goals. While many histories of the war contend that the U.S. Army in Vietnam implemented a narrow strategy of attrition, for which “body counts” became the lone indicator of progress, the truth is far more complicated. From the beginning of his tenure as the Military Assistance Command, Vietnam (MACV) commander, General William C. Westmoreland crafted and implemented a broad strategy that accounted for more than simply killing enemy forces. In fact, Westmoreland designed a campaign plan which included defending major political and population centers, preserving and strengthening the South Vietnamese armed forces, and reinstituting rural construction activities. Rather than relying solely on “body counts,” the MACV staff followed its commander’s lead by developing a vast system of metrics to analyze and assess nearly every aspect of a highly complex war. Unable to depend on metrics used in conventional conflicts like World War II or Korea—territory captured or enemy killed rarely told the whole story when combating insurgencies—MACV gathered statistics from across the political-military spectrum. Staff officers collected data on pacification security, South Vietnamese army training programs, the damage being inflicted on the enemy, and, later in the war, even popular attitudes among the rural peasantry. Other indicators reported on the effectiveness of South Vietnamese regional and territorial forces and on progress being made in economic and social development projects. The collection effort was staggering. One report alone—the Hamlet Evaluation System designed to help measure the progress of pacification in the countryside—generated a monthly average of 90,000 pages of reports. When added to MACV’s other analysis documents, the U.S. Army in Vietnam was producing 14,000 pounds of reports daily. Unfortunately for those attempting to make sense out of this astonishing amount of information, MACV put less effort in data analysis than it did in data collection. In part, data collection had become an end unto itself. It was, of course, difficult to gauge the sociological and cultural aspects of the Vietnamese insurgency. How could American officers, many not well versed in the intricacies of unconventional warfare, assess the pulse of revolutionary warfare in the context of village life inside South Vietnam? Understanding the social and political aspects of the National Liberation Front insurgency (better known by the pejorative term “Vietcong”) was challenging for even the most perceptive of officers. Americans literally were strangers in a strange land. Thus, MACV tended towards data collection, in part, because it was more tangible to them. Largely ignorant of Vietnamese language and culture, Americans focused instead on numbers—force ratios, incident rates, weapons losses, security of base areas and roads, population control, area control, and hamlet defenses. Comparisons between Vietnam and Afghanistan are fraught with peril, especially when interpretations of the former aim to prove or disprove certain positions concerning the latter. Still, the problem of measuring progress and military effectiveness in Vietnam can offer useful perspectives to those attempting to judge what, in fact, might be vital in Afghanistan. An objective reading of the long, disruptive conflict in Southeast Asia illustrates the challenges of defining progress and success in an unconventional environment. Commanders in Vietnam struggled to determine whom to trust among the local population, where the main threat lay, and which political-military groups posed the greatest threat to government stability in Saigon. Arguably, similar problems confront those waging war in Afghanistan today. The surplus of differing opinions on the state of progress in Afghanistan seems to indicate the unresolved difficulties of measuring what matters most in an unconventional war. [i] Nathaniel Flick and John Nagl, “The ‘Long War’ May Be Getting Shorter,” The New York Times, 20 February 2011. [ii] Bradley Klapper, “Ex-Pentagon adviser: U.S. should cut Afghan aid,” The Washington Times, 2 March 2011, citing consultant Mark Moyar. [iii] Leslie Gelb, “Hoist By Their Own Words,” The Daily Beast, 26 February 2011. [iv] “The Strategy and Tactics of Peace in Viet Nam,” Time, 28 March 1969, 19.